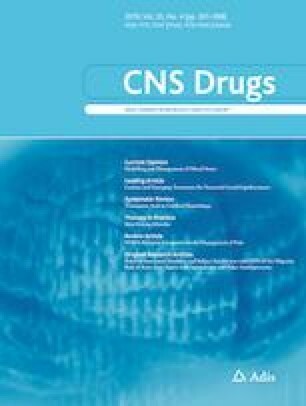 The commercial formulation of sumatriptan nasal spray is an effective option for migraine patients requiring or preferring a non-oral route of drug administration, but its utility is limited by poor absorption and tolerability issues. DFN-02, a new formulation of sumatriptan 10 mg nasal spray, is co-formulated with a permeation enhancer that gives it pharmacokinetics comparable to subcutaneous sumatriptan. 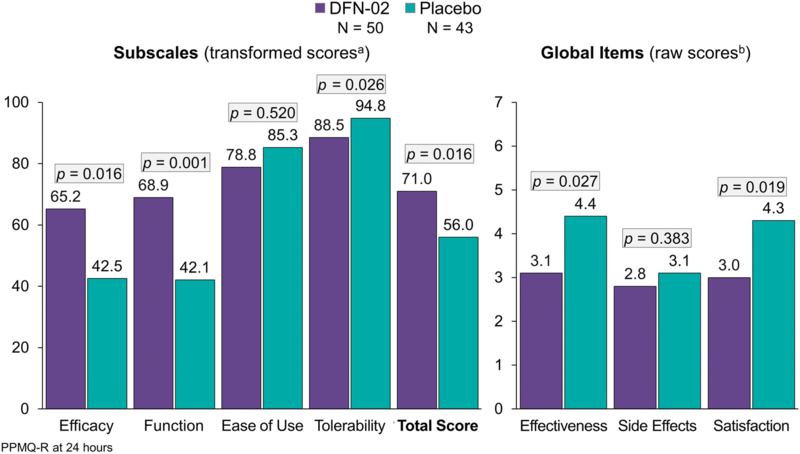 As reported previously, DFN-02 was significantly better than placebo on multiple efficacy endpoints at 2 h postdose, including pain freedom, absence of the most bothersome symptom, and pain relief, and its safety and tolerability profiles were excellent. The objective of this study was to assess the efficacy of acute treatment of migraine with DFN-02, including its effect on migraine-related functional disability and patient satisfaction with treatment. This was a multicenter, randomized, double-blind, placebo-controlled efficacy and safety study of DFN-02 in adults with episodic migraine. Functional disability and subject satisfaction with treatment were prespecified endpoints, assessed in real-time by subjects, using an electronic diary. In total, 107 subjects were randomized. DFN-02 was significantly superior to placebo for the reduction in functional disability score from predose level at 2 h after treatment (− 1.2 vs. − 0.6, p < 0.001). Subjects treated with DFN-02 were also more likely to be satisfied or very satisfied than subjects treated with placebo at 2 h postdose (70.0% vs. 44.2%, p = 0.027). Using the Patient Perception of Migraine Questionnaire-Revised at 24 h postdose, DFN-02 mean scores were significantly superior to placebo for the subscales of efficacy (65.2 vs. 42.5, p = 0.016) and function (68.9 vs. 42.1, p = 0.001), and for total score (71.0 vs. 56.6, p = 0.016); global medication effectiveness (p = 0.027); and overall satisfaction (p = 0.019). Placebo was significantly better than DFN-02 on the tolerability subscale (94.8 vs. 88.5, p = 0.026). At 24 h postdose, subjects reported significantly higher satisfaction with DFN-02 compared with satisfaction reported pre-randomization regarding their usual migraine medication (p = 0.012). 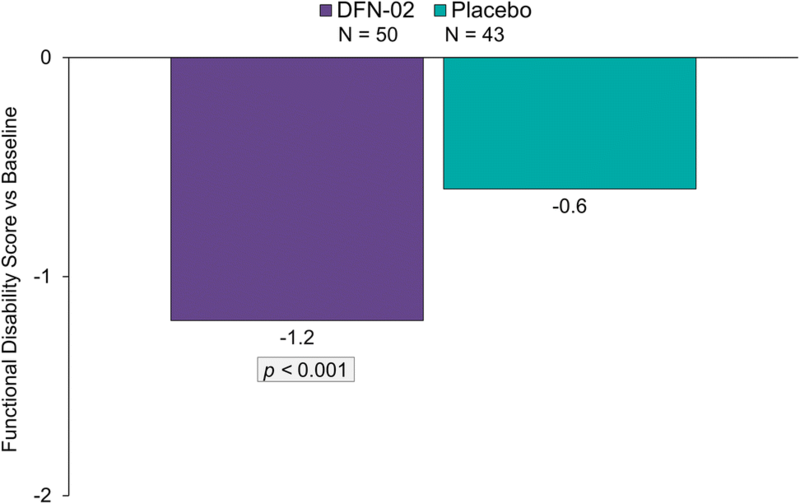 DFN-02 was superior to placebo for the relief of migraine-related functional disability, and provided greater satisfaction than placebo or subjects’ usual acute treatment. This was a multicenter, randomized, double-blind, placebo-controlled efficacy and safety study of DFN-02, sumatriptan 10 mg nasal spray with permeation enhancer, in adults with episodic migraine. DFN-02 was more effective than placebo for the relief of functional disability associated with migraine. Subjects were more satisfied with DFN-02 than with their usual acute treatment. Although migraine-related disability and patient satisfaction are infrequently discussed during consultations for headache [1, 2, 3], both are considered important components of efficacy in clinical trials . In fact, relief of headache-related disability is among the most important goals of acute treatment . Patients consistently rate restoration of function among the most valued attributes of acute medication [6, 7, 8]; the severity of migraine-related disability is predictive of dissatisfaction with acute treatment . Information about functional disability influences drug selection by medical professionals . Sumatriptan has been the predominant prescription migraine-specific acute treatment since 1992 [10, 11]. Although the subcutaneous injections are recognized as the fastest and most effective form of acute migraine treatment , most patients prefer tablets because they are familiar, easy to use, and associated with fewer adverse effects than injections. Guidelines for the acute treatment of migraine recommend subcutaneous injections or nasal spray formulations for patients who do not respond to oral triptans, patients with prominent gastrointestinal symptoms that interfere with orally administered acute treatments, and those for whom oral therapies are intolerable due to treatment-emergent nausea or dysphagia [5, 13]. Since many individuals dislike injections, other non-oral treatment approaches are used in people with needs unmet by oral therapy. One option, sumatriptan nasal spray, is effective and well-tolerated for the acute treatment of migraine [14, 15, 16], but its onset of action (30–45 min) is variable, suboptimal, and comparable to oral tablets . This may reflect limited nasal absorption ; peak plasma concentration is not reached for 1.75 h postdose . Dysgeusia is a frequent adverse effect that limits its use . DFN-02 (sumatriptan 10 mg plus 0.20% 1-O-n-Dodecyl-β-d-Maltopyranoside [DDM]; Promius Pharma, Princeton, NJ, USA) is an intranasal migraine medication that was designed to address the shortcomings of the commercially available formulation of sumatriptan nasal spray. Its active ingredient, sumatriptan, has been comprehensively analyzed in the past. The permeation-enhancing effects of the DDM excipient in intranasal formulations are based on its effects on mucosal viscosity and membrane fluidity, which relax cell–cell junctions and facilitate drug transport across the nasal epithelium. DFN-02 has previously demonstrated absorption into the systemic circulation 5 min faster than the 4 and 6 mg subcutaneous doses of sumatriptan , and it had good tolerability in a 6-month safety study in adults with episodic migraine . Additionally, DFN-02 was evaluated in adults with migraine and was shown to be significantly better than placebo for pain freedom, pain relief, absence of the most bothersome symptom (MBS), and freedom from associated symptoms at 2 h postdose, with an excellent tolerability profile . Despite a growing body of research with DFN-02, the capacity to relieve functional disability and the degree of subject satisfaction associated with DFN-02 treatment have not been evaluated. Accordingly, the objective of the present study in adults with episodic migraine was to compare DFN-02 with placebo for acute relief of functional disability and with usual treatment for subject-rated treatment satisfaction. The methods for this study (NCT02856802) have been described in detail elsewhere . To qualify, subjects had to be adults aged 18–75 years with episodic migraine meeting the criteria of the International Classification of Headache Disorders, 3rd edition (beta version; ICHD-3 beta) . They also had to have a 12-month history of two to eight attacks per month, with 14 or fewer headache days monthly and at least 48 h of headache-free time between attacks. Subjects were excluded if they had medication-overuse headache (as defined by ICHD-3 beta); used any botulinum toxin treatment within 120 days of screening; changed doses of migraine preventive medications during the 30 days before and through screening; took miniprophylaxis for menstrual migraine; or had a health condition likely to affect the physiology of the nasal mucosa or any pathology that might interfere with treatment or the outcomes of the study. DFN-02 and matching placebo spray (manufactured by Renaissance, Lakewood, NJ, USA) were provided in single-use intranasal spray devices designed to deliver 100 μL/spray containing either 10 mg of sumatriptan plus 0.20% DDM or placebo containing 0.20% DDM but no sumatriptan. The study included four visits: screening, baseline/randomization, end of the first double-blind treatment period/re-randomization into a second double-blind treatment period, and end of the study/early termination. At screening, subjects signed informed consent; had a medical history and physical examination; and were assessed for vital signs, serology, urine pregnancy test, clinical laboratory tests, urinalysis, urine drug test, and 12-lead electrocardiogram (ECG). Hematology, clinical chemistry, urinalysis, urine drug screen, and human immunodeficiency virus, hepatitis B surface antigen, and hepatitis C virus antibody analyses were performed by Eurofins Central Laboratory (Lancaster, PA, USA). For qualified subjects, the investigator or designee contacted the designated interactive web response system to obtain a unique patient identification number for use throughout the study. Subjects were trained on how to enter migraine and study medication data into a real-time electronic diary (eDiary). The eDiary was dispensed at screening for subjects to enter at least one migraine attack to ensure their comfort and compliance with the device. Subjects continued to take their normal migraine medication during the screening period, which lasted up to 21 days to ensure that they met the eligibility criteria. Once eligibility for enrollment was confirmed, the investigator or designee contacted the interactive web response system centralized randomization center to receive the blinded study medication kit assignment. At baseline, subjects were randomized (1:1) to receive DFN-02 or matching placebo. Study site staff instructed subjects in the proper self-administration of study medication and subjects were confirmed to have, or were provided with, written instructions for use. In the first double-blind treatment period, subjects were instructed to use one nasal spray device to treat a single migraine attack as soon as (and no more than 1 h after) they experienced migraine pain of moderate to severe intensity. If subjects were unable to use study medication for the first attack after randomization, they were instructed to use the study medication for the next qualifying attack. Subjects were permitted to take a second dose of study medication or rescue medication if they failed to experience sufficient relief from the first dose within 2 h and they had recorded a 2-h postdose assessment in the eDiary. The choice of rescue medication was made by investigators and subjects, and no more than two doses of study medication were permitted within a 24-h period. Subjects who treated an attack and recorded their response to medication in an eDiary were re-randomized into a second double-blind treatment period in which they treated a second migraine attack at any level of pain intensity. The study was powered and data are presented for the first double-blind treatment period. After they were randomized, subjects could participate in the study for no more than 10 weeks. Subjects recorded information about their attacks, the effects of study medication on functional disability, and satisfaction with treatment, in the eDiary; other data, such as safety and tolerability, were entered by site staff into electronic case report forms. After study completion or discontinuation, subjects were referred to their usual healthcare professional to continue treatment of migraine and other conditions. This report presents the results of the DFN-02 comparison with placebo on the efficacy endpoints of functional disability and subject satisfaction with treatment at 2 h and 24 h postdose. Other efficacy data from this study, including data on the endpoints of pain freedom, pain relief, and absence of the MBS, have been presented elsewhere . Functional disability was assessed at predose, 2 h postdose, and 24 h postdose on a scale where 0 = no disability, able to function normally; 1 = performance of daily activities mildly impaired, could still do everything but with difficulty; 2 = performance of daily activities moderately impaired, unable to do some things; and 3 = performance of daily activities severely impaired, unable to do most things, bed rest may have been necessary . Satisfaction with treatment at 2 h postdose was evaluated on a 7-point Likert-type scale , where 1 = very satisfied, 2 = satisfied, 3 = somewhat satisfied, 4 = neither satisfied nor dissatisfied, 5 = somewhat dissatisfied, 6 = dissatisfied, and 7 = very dissatisfied. Scores were categorized as satisfied (1–3), satisfied/neither (1–4), neither/dissatisfied (4–7), and dissatisfied (5–7), and the degree of subject satisfaction with treatment was defined by these categories. The Patient Perception of Migraine Questionnaire-Revised (PPMQ-R) [24, 25] was used at baseline (pre-randomization) to assess subjects’ satisfaction with their usual pre-study migraine treatment, and was also used at 24 h postdose to assess subjects’ satisfaction with the study medication. The PPMQ-R scale comprised items for efficacy (11 questions), function (4 questions), ease of use (2 questions), and tolerability (10 questions). Cost-related items were excluded because there was no charge for study medication. Three global items measured subject satisfaction in terms of medication effectiveness, adverse effects, and overall satisfaction. The total score was comprised of the efficacy, function, and ease of use subscale scores. The tolerability of adverse effects (i.e. bothersomeness of adverse effects) was scored on a 5-point Likert-type scale that ranged from 1 (not bothersome at all) to 5 (extremely bothersome). Each PPMQ-R subscale score and the total score were transformed to range from 0 to 100 by subtracting the lowest possible scale score, dividing the range of the scale, and multiplying by 100, with higher scores indicating better satisfaction or tolerability. For the transformed scale, higher scores mean greater satisfaction. The total raw score and the three global items were not transformed, and therefore lower scores denote better satisfaction. If a response was missing, the particular subscale or global item was considered non-evaluable. If a subscale or global item was deemed non-evaluable or missing, the corresponding total score was also considered non-evaluable. Safety variables included the incidence of adverse events (AEs), clinical laboratory data (hematology, chemistry, and urinalysis), vital sign measurements (sitting blood pressure, pulse, respiration rate, and body temperature), physical examination findings, 12-lead ECG readings, urine pregnancy test results, study medication use, and concomitant medication use. The safety endpoint assessments included tolerability as assessed by AEs for each treatment period, and overall and safety as assessed by clinical laboratory tests, vital signs, and ECGs for each treatment period and overall. Adverse events were coded using the Medical Dictionary for Regulatory Activities (MedDRA, version 19.0) and classified by severity (mild, moderate, severe) and causality (not related, possibly related, probably related, definitely related). Severe AEs were defined as AEs that prevented normal everyday activities and usually needed treatment or other intervention. Investigators also characterized the seriousness of AEs, and serious AEs (SAE) were defined as any untoward medical occurrences or effects that, at any dose, resulted in death or were life-threatening, required or prolonged inpatient hospitalization, resulted in persistent or significant disability/incapacity, or were congenital anomaly/birth defects. Not all severe AEs were SAEs. The study populations for analysis included all subjects who were screened (for disposition), all randomized subjects who took at least one dose of study medication and had at least one postbaseline efficacy time point (for efficacy), and all subjects who received at least one dose of study medication (for safety). Data presented are based on a statistical analysis plan with prespecified endpoints, except for two data points (percentage of subjects with no disability, and percentage of subjects with mild/no disability), which were analyzed post hoc. Analyses and summaries were produced using SAS version 9.3 or above (SAS Institute, Cary, NC, USA). Analyses on quantitative and categorical variables included data from subjects with non-missing values, and missing or incomplete data were imputed only for summaries of AEs. Unless specified otherwise, all statistical testing and confidence intervals (CIs) were two-sided and were performed using a significance (alpha) level of 0.05. For analyses of functional disability, the number of subjects with response, the number of subjects with non-missing assessments, proportions for the DFN-02 and placebo groups, 95% exact CIs for those proportions, the odds ratio for response, and the corresponding p values from Fisher’s exact test were computed for comparisons between the treatment groups. For the assessments of subject satisfaction, p values from the Wilcoxon rank-sum and signed-rank tests were computed. Nine sites in the US participated in the study, which was conducted between 11 July 2016 and 10 February 2017. A total of 107 subjects met the inclusion criteria and was randomized into the study; 93 (86.9%) subjects received at least one dose of study medication and had at least one postbaseline efficacy assessment, and 86 (80.4%) subjects completed the study. In total, 21 (19.6%) subjects discontinued early. Subject disposition is presented in Table 1. Most subjects were female (80.6%) and White (88.2%), and the mean age was 42.3 years (19–68). The mean weight was 78.5 kg (20.0), and the mean body mass index was 28.2 kg/m2 (6.9). Most subjects (78.5%) had never smoked. The migraine history showed that subjects averaged three (24.7%) to four (23.7%) attacks per month, and 53.8% had a history of migraine without aura. Nearly all subjects had a history of photophobia (98.9%) and phonophobia (93.5%) during attacks, with slightly lower proportions reporting a history of nausea (86.0%). Treatment history showed that usual migraine medication provided 34.4% of subjects with significant reductions in symptoms, 34.4% with slight reductions, 26.9% with complete relief, and 4.3% with no relief. Most subjects had their attacks significantly or completely resolved within 1 h (30.1%) or 2 h (12.9%) of treatment. The most commonly used acute medications were ibuprofen (30.1%) and caffeinated analgesic combinations (32.3%). A few subjects (11.8%) typically used sumatriptan. The mean change in score from baseline at 2 h postdose was significantly greater in the DFN-02 group than in the placebo group (− 1.2 vs. − 0.6, p < 0.001) (Fig. 1). Overall, 56.3% (27/48) of DFN-02 treated subjects had no functional disability compared with 28.2% (11/39) of placebo-treated subjects (p = 0.01), and 83.3% (40/48) of subjects in the DFN-02 group had mild or no functional disability compared with 64.1% (25/39) of those in the placebo group (p = 0.05) at 2 h postdose. At 24 h postdose, there was no significant difference in disability scores between the treatment groups. At 2 h postdose, mean (standard deviation) 2-h overall subject-rated treatment satisfaction scores were significantly better with DFN-02 than with placebo (2.8 [1.48] vs. 4.1 [2.06], p = 0.003). The results of the PPMQ-R completed by subjects in their eDiary at 24 h postdose are shown in Fig. 2. Subjects in the DFN-02 group were significantly more satisfied than those in the placebo group on the PPMQ-R subscales for efficacy (p = 0.016), function (p = 0.001), global items of medication effectiveness (p = 0.027), and overall satisfaction (p = 0.019), as well as on the total score (p = 0.016). The PPMQ-R tolerability subscale was significantly better for placebo than DFN-02 (p = 0.026). There was no significant difference between the treatment groups for the subscale of ease of use and on the global item of adverse effects. Among subjects treated with DFN-02, the treatment satisfaction at 24 h postdose was significantly greater than subjects’ satisfaction with their usual pre-study migraine medication, based on the baseline PPMQ-R for the total score (74.6 vs. 62.2, p = 0.012). Safety data for this study have been reported previously . Briefly, no SAEs or treatment-emergent AEs (TEAEs) leading to discontinuation from the study were reported, and there were no clinically meaningful changes in clinical laboratory variables, vital signs, or ECG results. In this multicenter, randomized, double-blind, placebo-controlled study, where subjects treated a migraine attack of moderate to severe headache and reported outcomes in a real-time eDiary, DFN-02 was significantly more effective than placebo for relief of functional disability and for subject satisfaction with treatment. DFN-02 subjects had a significantly greater reduction in functional disability at 2 h postdose than placebo subjects, and the proportion of subjects with no disability at 2 h postdose was significantly higher in subjects treated with DFN-02 than in subjects treated with placebo. At 2 h postdose, a significantly greater proportion of subjects were satisfied with DFN-02 than with placebo. At 24 h postdose, subject-rated satisfaction with DFN-02 was significantly higher than with placebo on multiple PPMQ-R subscales, global items, and the total and raw scores, and with subjects’ usual treatment for acute relief of migraine. Given the importance of restored function to migraine patients, the results with DFN-02 for relief of functional disability are promising relative to findings from previous studies of the commercially available form of sumatriptan nasal spray. In two randomized, double-blind, parallel-group, multicenter studies with a 20 mg dose of the commercial formulation, 72–74% of subjects had mild or no disability at 2 h postdose . In a randomized, double-blind, parallel-group, placebo-controlled study of the 20 mg commercial nasal spray, in which up to three migraine attacks were treated over a 6-month period, 70% of subjects had no or mild disability at 2 h postdose . A meta-analysis of two studies (n = 225) with sumatriptan 20 mg found that 62% of subjects had mild or no functional disability at 2 h postdose [14, 16]. In the present study, 83.3% of DFN-02 subjects had mild or no functional disability and, perhaps more clinically relevant (albeit unreported in previous studies), 56.3% were free from disability at 2 h postdose. Overall, nearly one third of patients with migraine are dissatisfied with their usual acute medication . Prior assessments of satisfaction with sumatriptan nasal spray in adults compare it with the oral tablet and injectable forms , or they evaluate satisfaction with multiple formulations of sumatriptan prescribed simultaneously . However, in a 12-week study of sumatriptan 20 mg nasal spray in subjects whose attacks did not respond to first-line therapy, 60% of subjects preferred sumatriptan nasal spray 20 mg to their usual treatment . Following treatment with DFN-02, 70–78% of subjects treated with DFN-02 were satisfied with treatment, and subjects were significantly more satisfied with DFN-02 than with placebo, and with usual treatment at 2 and 24 h after treatment. DFN-02 showed excellent tolerability in this study. A prior meta-analysis of two studies (n = 516) found that the proportion of subjects who experienced any AE within 24 h following sumatriptan 20 mg was 38% (vs. 9.7% with DFN-02), and the rate of the most common adverse effect with intranasal formulations, dysgeusia, was 27%  (vs. 2.0–8.1% with DFN-02 ). Treatment-emergent nausea, which can be the clinical rationale for recommending a trial of an intranasal spray , affected 19% of subjects in previous research , but was not reported with DFN-02. Although comparing results from studies with different methodologies and populations does not allow for definite conclusions, DFN-02 does appear to offer improved tolerability relative to the original form of sumatriptan nasal spray. Accordingly, DFN-02 may be particularly beneficial in patients who are nauseated by oral agents and do not want to take injections . A limitation of this study is its relatively small sample size. A larger study population would have strengthened the analyses and enhanced the generalizability of its findings. DFN-02 was significantly more effective than placebo in reducing migraine-related functional disability. Subjects’ satisfaction with DFN-02 was significantly superior to placebo at 2 and 24 h postdose. There was also greater satisfaction with DFN-02 compared with the subjects’ pre-study usual migraine medication. Subjects treated with DFN-02 experienced few TEAEs and no SAEs, and there were no withdrawals due to safety or tolerability. DFN-02 intranasal spray, which combines 10 mg of sumatriptan with a permeation-enhancing excipient, was effective and well tolerated in the acute treatment of adults with episodic migraine. Medical writing services were provided by Christopher Caiazza, who, under the direction of the authors, prepared and revised the manuscript, tables, and figures. The authors thank Katherine D’Angelo (Dr. Reddy’s Laboratories, Princeton, NJ, USA) for assisting with the conduct of this study (DRL Publication #843). This study was funded and sponsored by the Dr. Reddy’s Laboratories group of companies, Princeton, NJ 08540, USA, which also paid the open access fee. Sagar Munjal and Elimor Brand-Schieber are employed by and own stock in Dr. Reddy’s Laboratories Ltd. Richard B. Lipton and Alan M. Rapoport are paid consultants of Dr. Reddy’s Laboratories Ltd, but they were not paid to draft or edit this paper. Richard B. Lipton has received grant support from the National Institutes of Health, the National Headache Foundation, and the Migraine Research Fund. He serves as a consultant and advisory board member for, or has received honoraria from, Alder, Allergan, American Headache Society, Autonomic Technologies, Boston Scientific, Bristol Myers Squibb, Cognimed, CoLucid, Eli Lilly, eNeura Therapeutics, Merck, Novartis, Pfizer, and Teva, Inc. He has stock options in eNeura Therapeutics and Biohaven Pharmaceuticals. He also receives royalties for Wolff’s Headache, 8th Edition (Oxford University Press, 2009). Alan M. Rapoport is on the speaker’s bureau of Amgen, electroCore, Promius Pharma, and Teva, and is a consultant for Amgen, Autonomic Technologies, Neurolief, Satsuma, Theranova, and Zosano. All procedures performed in studies involving human participants were in accordance with the ethical standards of the institutional and/or national research committee and with the 1964 Helsinki declaration and its later amendments or comparable ethical standards. The protocol, patient information and consent form, and other relevant study documentation were approved by the Institutional Review Board (IRB) for each study center prior to initiation of this study. IMITREX (sumatriptan succinate) tablets [prescribing information]. 2017. Available at: https://www.gsksource.com/pharma/content/dam/GlaxoSmithKline/US/en/Prescribing_Information/Imitrex_Tablets/pdf/IMITREX-TABLETS-PI-PIL.PDF. Accessed 24 Jan 2019. IMITREX (sumatriptan succinate) nasal spray [prescribing information]. 2017. Available at: https://gsksource.com/pharma/content/dam/GlaxoSmithKline/US/en/Prescribing_Information/Imitrex_Nasal_Spray/pdf/IMITREX-NASAL-SPRAY-PI-PIL.PDF. Accessed 24 Jan 2019.